I was bullied all through school because of how I looked. I grew up with such low self-esteem that it made me susceptible to peer pressure and I was never able to defend myself. I’m a survivor of anorexia and bulimia nervosa and a survivor of assault. I don’t believe many people know that about me…but I can’t ignore that it does play a huge role in who I am today. When I got to college, I pursued a degree in International studies. It wasn’t however until the summer before my senior year when I overcame my fear of the weight room and decided I wanted to try and lift weights. I did my research online on how to get started, and from that point forward, I started going every day to my college gym and taught myself how to lift. I immediately fell in love with the gym and began to immerse myself into the fitness industry, and the fitness community. Fast forward 5 years, I have my own Youtube channel nearing 11K subscribers, I’ve competed in 3 bodybuilding competitions as a bikini competitor, I have an Instagram community of my own with 58K followers, my own online coaching business, my Personal Training certification, and I STILL am just getting started. Because of my past experiences, I adopted the hashtag #StrongerThanMyStruggles. I want to share with others that your struggles don’t define who you are, and that they are actually your tool towards strength. I had the pleasure of interviewing Joanna Rohlf, an online fitness coach and fitness influencer based out of the Washington, DC metro area. 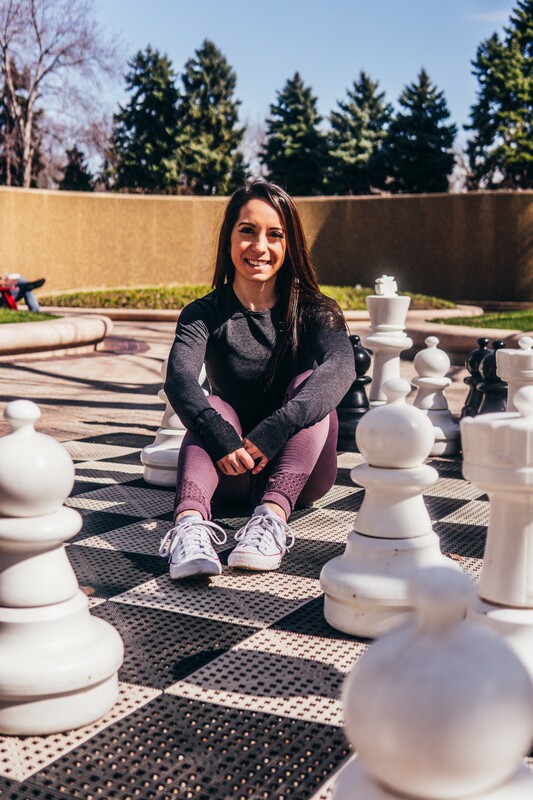 Joanna is a NASM Certified Personal Trainer, founder of the #fiercelyfitfam community of women, an NPC bikini competitor, and has been featured in publications such as Train for Her magazine. I was bullied all through school because of how I looked. I grew up with such low self-esteem that it made me susceptible to peer pressure and I was never able to defend myself. I’m a survivor of anorexia and bulimia nervosa and a survivor of assault. I don’t believe many people know that about me…but I can’t ignore that it does play a huge role in who I am today. When I got to college, I pursued a degree in International studies. It wasn’t however until the summer before my senior year when I overcame my fear of the weight room and decided I wanted to try and lift weights. I did my research online on how to get started, and from that point forward, I started going every day to my college gym and taught myself how to lift. I immediately fell in love with the gym and began to immerse myself into the fitness industry, and the fitness community. Fast forward 5 years, I have my own Youtube channel nearing 11K subscribers, I’ve competed in 3 bodybuilding competitions as a bikini competitor, I have an Instagram community of my own with 58K followers, my own online coaching business, my Personal Training certification, and I STILL am just getting started. Because of my past experiences, I adopted the hashtag #StrongerThanMyStruggles. I want to share with others that your struggles don’t define who you are, and that they are actually your tool towards strength. I try and share any kind of positivity to my clients and to my audience on my social media platforms as best as I can. I do not take my relationships I’ve created and my reach for granted. Something that I always keep in mind is that you truly never know who is watching. One thing that I could decide to say today in a post, a Youtube video, or even in a tweet could be the one thing that motivates someone to change their perspective on themselves or their situation. I have seen this to be true myself, which is why I always try my best to be kind, positive, and approachable on my platforms. I’ve had more than a handful of times where I have shared something personal about myself or a thought I am having, and will immediately receive a DM from someone thanking me for posting it. I am still realizing every day how much of an impact I can have on people…even when I feel like I am not making an impact on anybody. One of the ways I do this, is that every week, I will feature someone who utilizes the hashtag I adopted #StrongerThanMyStruggles into one of their Instagram posts. Followers of mine who like the message are encouraged to share their own stories in an Instagram post and talk about an experience of theirs when they were stronger than their struggles. I believe in the power of communication, and so I want for everyone to feel empowered to share their stories. Someone out there could be in need of hearing about it. The biggest thing I would advise is to make sure you are doing it for the right reasons. You need to have your heart in it and a passion for helping other people to better themselves. Many people who get into the coaching business whether for fitness or even coaching fitness coaches, they do it solely for shallow and monetary reasons. If you don’t have a passion for it, it will show in your communication with your clients and audience and in your client results. It is easy to tell when someone isn’t genuine and doesn’t have the passion. If you don’t, you won’t grow the business you want. Two people immediately come to mind. The first being my sister. She is the first person I went to when it came to asking all my fitness questions when I was a complete newbie. If it weren’t for her helping me out, giving me advice, and answering my questions I am not so sure if I would have been as motivated to get into the gym. The second being my boyfriend of 7 years, Brian Meiggs. He was literally there through my entire fitness journey. He witnessed all the changes I went through and was there for everything decision I made. He supported me through 3 contest preps, the start of my Youtube channel, and pushed me to launch my business and website. My brand new website and blog are soon launching! Through this website, I will be launching new workout guides, fitness challenges, and sharing all of my fitness related experiences and knowledge through blogging. Make sure to check it out at www.joannarohlf.com! Do you have knowledge or skills that your audience could benefit from? An example of how I make money is by selling my coaching services, workout guides and customized programs, fitness challenges, and more. I am selling who I am as a coach, someone who can help my clients gain confidence in the gym and feel better physically and mentally. I am selling more than just a physical result of muscle gain or fat loss — I am selling them the opportunity to better themselves, whatever that means to them. My demographic is primarily East Coast based, and of course I have a large Mid-Atlantic based following. This year, myself and a close friend created a workshop that we call the DMV Fit Workshop. This November will be our 3rd time hosting this workshop, where we invite local women to come together and discuss fitness related topics, network, and workout together. Establishing a community where you live, especially in a major city, is a great way to not only network, but a great way to also get your own name and personal brand out there. In the digital era we live in now, you can have anybody in the world find you online by simply uploading a video file. An example of this could be through Youtube. You not only can monetize your videos through ads, but you can also collaborate with brands and get paid to promote their products. This varies on your reach, engagement, and how reputable you are, but it’s possible to be able to work with brands you love. I have been able to work with brands such as Adidas, Gold’s Gym, and Under Armour! Whether you are able to earn commission through sales, get paid for promotional posts, or earn free product, there are many opportunities out there to collaborate with brand names. Ask your clients to not only provide testimonials for you, but to spread the word about your services and what makes you stand out from other people. You could also provide an incentive to your existing clients such as receiving discounts on future programs or even free guides if they assist you with increasing your clientele. Lewis Howes. His podcast helped me change my outlook and perspective on negative situations in life. I started listening to his podcast almost a year ago, and in every episode, I always take away something that helps me to improve my attitude and stay positive through the rough moments. My number one platform that I use is Instagram. My handle is @ohhhjojo. On my Instagram page, I always share workout ideas, motivation, and fitness inspiration and it is the platform I use to make new connections in the fitness community. For more related content, I also post videos to my Youtube channel. You can search “Joanna Rohlf” on Youtube to find me!